If you would like us to provide you with more information, resolve any doubts you may have or answer your questions about BIC and its offerings, just take a moment to complete the simple contact form and we will get in touch with you as soon as possible! 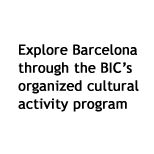 Should you have questions or concerns of a more immediate nature, please do not hesitate to use the information listed above to contact Barcelona International College. We look forward to speaking with you! All courses at BIC are accredited through Jacksonville University in Florida, an institution that combines the advantages of a liberal-arts college with the strengths of an urban comprehensive university. Get more information now! Download brochure! We know that the classroom is only one part of the greater study abroad experience, which is why we organize extracurricular activities, visits, excursions & trips and encourage you to get involved! Amongst other services, you will have 24-hour Student Support available to answer questions, resolve doubts and assist you in any way.